A detailed map of Greenland (a country within the Kingdom of Denmark) with special features. A rather big map for the world's biggest island. The center of the ice sheet (scaled down for the map) and Greenlands mountain ranges are barriers. Stations allow crossing the ice. Towns with airports connect, allowing quick operations across municipalities - air transport is important in Greenland since there are no roads connecting towns. Small bonuses are old municipalities and geographic regions, superbonuses are groups of municipalities. Territories are based on geography: basins and topography. Major towns and present-day municipalities have bonuses set to zero. With these you can create unorthodox games. (If you're looking for accurate 2018 subdivisions look for the zero bonuses). Most names are real places retrieved from Mapcarta.com. Some names are fabricated from the Greenlandic Inuit language. Review by Nathan on 7/9/2018. Great map! Love the central pass system. My only suggestion would be more sea connections up the northeastern coast. Thanks, the northeast doesn't have any settlements so it is inaccessible via sea route. This I believe is a good counterpoint to the rest of the map where a different kind of game is encountered. Review by Atlantis on 8/8/2018. Review by Arachnocat14 on 8/12/2018. 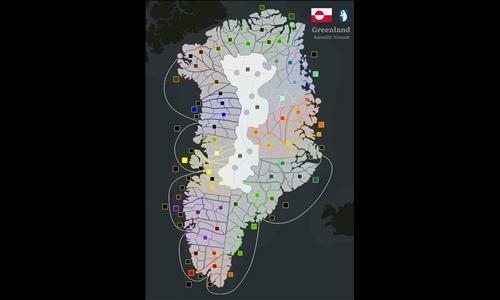 The gameplay does not work very well due to the shape of the map and too many chokepoints. I found it to play well, albeit unconventionally. Review by DrBOB101 on 8/4/2018.